I am sure you understand the meaning of focus, right? But do you know what my SUPER abbreviation means?? Follow one course until successful in my opinion is vital for succeeding online. OK, I’ll put my hands up, with GUILTY written across my forehead! I have bought product after product, shiny object after shiny object, chasing the internet dream. Trying to find that one product that’s going to make me boat loads of money. But if i’m being honest, have I truly followed one of those good courses/ products until successful? Ultimately NO I have not. Don’t get me wrong you need to follow a good proven business model, I have purchased products in the past that are… how do I put it…. Crap. So step 1 is to find the right business model/ course/ mentor to learn from. Step 2 is to follow that one course until successful. Emphasis on the word “ONE”! You cannot jump and bounce around from one opportunity or product to another and not following through with implementation and consistent action. It won’t work! You need to FOCUS on that one system! If you stay disciplined and focused on one proven online business model until successful you will be a success PERIOD! Post your comments below and show me some luurvvv! I guess a lot of us are shiny object veterans and I imagine most of us on P2S are veterans as well but we realised that we need to take a different approach and that is what brought us here. Like the F.O.C.U.S anagram it really makes you think about it and keep it in your mind. Even few days ago I almost join another program just from curiosity but I gave up at the last moment…will not be that guy until I finish P2S and I really hope that I will not need to be that guy any more. I love your interpretation of FOCUS. In fact jumping from one product to another is the biggest mistake one can do. There are many temptations around and surely not all of them are just shiny objects. But even another great program would mean splitting the available time and do both courses just halfheartedly, rather than with the dedication they ask for. Thanks Torsten, Yes true even if you got involved into another great program you are not focusing on one system with 100% dedication. Nice to read the above comments as well as your article to realize I’m not alone with Shinny Object Syndrome. 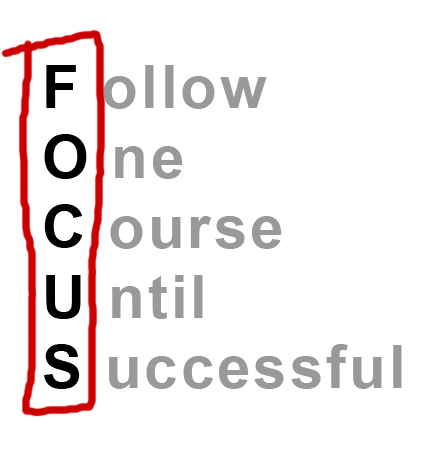 My next post was going to be about focus, but I’ve gone off at so many different tangents since – aghhhh…….. I like your acronym for focus. This is great and very well thought out. I have been known to fall for many shiny objects as well, but since joining Partnership To Success, I have not been quite as bad! A great post, and I liked it very much! Like you I am also guilty of buying products and course and not seeing them through to the end. My problem with many course was the lack of support and mentoring that you don’t get with ‘cheaper’ course. So as soon I hit a hurdle and had no one to help me I got discouraged, heard of something else and off I went. Now with the P2S course I have found the right course with the right mentor and plan to follow through to end. I think a lot of us have a problem with maintaining focus; our world is created around multi-tasking even more and more with technology trying to get us to use it as much as possible and do our everyday things (watch tv and tweet, shop and coupons, run and monitor steps etc.). It’s funny that I even find that when I am focused on one project at a time, I get a lot more accomplished than dividing my time across multiple projects! True maintaining focus isn’t easy, there are so many distractions trying to grab our attention. But to be successful you need to have the ability to block out the unnecessary noise and laser focus on one project only then can you be super productive, get things done and move you business forward at great speed. I was very impress with your blog, and the interpretation of FOCUS. I have a great problem with keeping focused, but now I have posted your interpretation of FOCUS, on my board in front of me, when I am at my desk, I see it every day. Thank You Raj, you have done a great job! I have it pinned next to my desk too. Its a reminder everyday to not only FOCUS but focus on one system until successful. And really cool acronym. After reading such a creative post, I have FOCUS ingrained in my mind. And for good reason! Raj you hit the nail on the head with this. I’ve had this problem many times in the past as far as jumping from product to product. Also you are very correct when it comes to choosing a business model first that is right for you then proceed to choosing the best training course and go from there. I have learned that its best to focus on one model at a time, become successful at it, and then venture out into other areas of IM.